'What's this?' I hear you all saying to yourselves... 'menswear on That's Peachy?!' Well yes, that's right... I think Robbie was sick of being behind the camera and wanted to get in on a bit of the action to be honest, although he was a bit nervous! 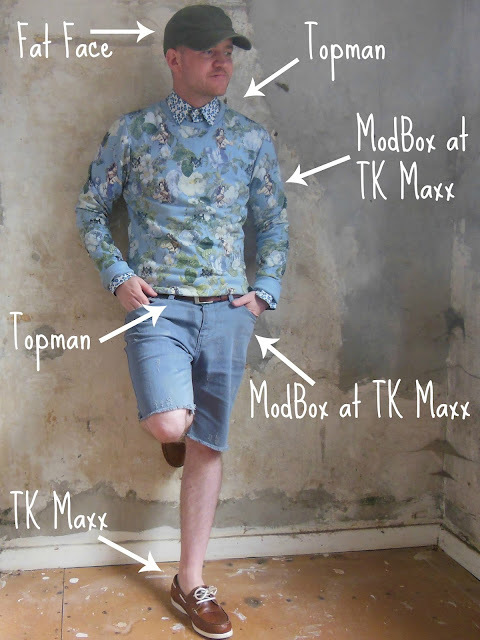 I was asked by TK Maxx to check out the new menswear section in their stores called ModBox, and offered a voucher to spend on an outfit. I was so glad that Robbie agreed to be featured on my blog, because he absolutely loves the clothes, and I found it really interesting shopping in the men's section for a change. The ModBox clothes are very trendy and quirky... a lot of the pieces reminded me of things I've seen Joey Essex wearing, quite cool clothes that are that little bit different. Some of the pieces are very 'stand out from the crowd' style, but mixed with some of the more subtle pieces from the range, I think some really amazing looks can be made. We shopped in the Newcastle store, and were quite spoilt for choice. The range is really big and versatile, with lots to suit pretty much any guys taste, size, age etc. There were some lovely, smart blazers, and the coolest printed t-shirts, which I loved paired together for a contrast between smart and casual. I wanted to choose the entire outfit myself and style Robbie in the clothes, but he's really quite fussy and has his own ideas of what he likes to wear. If I buy him clothes for Christmas or his birthday, you can usually guarantee he will exchange it. For this little project, we came to a bit of a compromise, where I pulled out a selection of tops and trousers, and he got to try them on and choose his favourite outfit. I gave him a handful of printed polo shirts, some with vintage style prints, some aztec prints and some plainer ones but he went for the sweatshirt, which I also really like... I do really like florals on men. I also tried to convince him to get a pair of Olly Murs-esque chinos, but he decided to go for the cut off shorts. Robbie styled the finished look as quite chilled, comfy outfit with a few elements of a smarter ensemble, which he described as a transitional outfit for wearing from Summer to Autumn, or for Summer nights when it's a little bit cooler. I took note of the other pieces he liked from Modbox, and I'm thinking about going and picking them up for his birthday - at least I know he won't take them back! Love this post, that jumper is very cool! Whenever I venture in TKMaxx I never feel brave enough to look through Modbox for myself. It overwhelms me! Ah he loved it really!! ;) He looks fab.